Successful 80’s tribute band have a very rare opportunity for a highly experienced frontman with incredible vocal range to join the band. 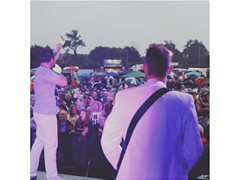 Supported by a highly professional backing band and a multi-thousand following you will enjoy the benefits of stepping straight into an established band. Please only apply if you are from Leicester or very close surrounding. Must know your stage craft and engage our audience. Must be personable with the rest of the band and crew as well as fans and clients. The successful applicant will be required to comply with the band image which will require some small investment.